Black cod, which is also known as sablefish, is found in the Northern Pacific Ocean in an arc extending from California to Japan but mostly around Alaska and the Aleutian Islands. It is no relation of the cod on sale in every fish and chip shop. Black cod's USP is its high oil content - about 20 times the level in Atlantic cod. Whereas most fish use an air bladder to regulate their depth, the black cod uses oils in its muscle. These oils gives it a rich velvety mouthfeel worth £40 a serving in a fancy restaurant. It wasn't always thus. 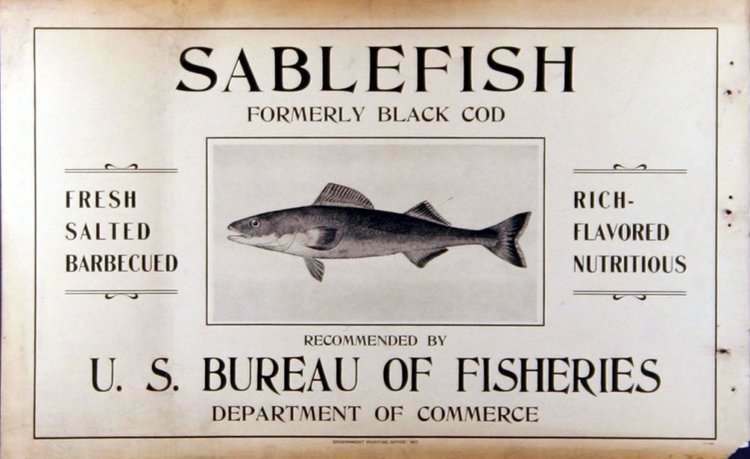 In 1916 a Seattle fish merchant rued the unjustified cheapness of black cod: "it is a fish that will [only] reach the poorer people, until the demand grows, as no doubt it will, to such an extent as to advance the price." He was proved right, although it took about 70 years. Perhaps the problem was in the name. Black cod got its name pretty randomly about 200 years ago when the first English speaking people arrived on America's Pacific coast. Someone recognised the black cod as being similar in shape and size to the cod so well known to every European - except it was black. So it went by that name for the next hundred years. By which time not everyone was happy with it. The Pacific Fisherman magazine pointed out that "the consumer who wants a cod is always disappointed upon purchasing it, while the many consumers who want a rich fish, such as is the black cod, refuse to take it because of the fear that it would be what its common name implies..." When the boss of a big Pacific fish merchant signed up to the campaign, the US Bureau of Fisheries was pushed into action. And the name they decided on was sablefish. Presumably the silky texture of the fish inspired thoughts of silky sable fur. But they never quite succeeded. The USA and Canada usually stick with Sablefish but it seems that the messge never got to Mr Matsuhisa, who you will meet in a minute. When he ended up batting for black cod the battle was never going to be won. The black cod fisheries of Alaska and Canada are a fascinating 30 year morality tale of over-fishing, the grasping of the problem, hamfisted efforts to solve it and ultimately, success. Although black cod was nothing special in the USA and Canada until recently, Japan had always considered "gindara" a top drawer fish. In the years when fishermen were free to drop their nets up to 3 miles off any coast, Japanese boats would make the trip across the Pacific to scoop up the black cod. It was a useful supplement to their own more modest supplies. Local fishermen were not offended - to them, black cod was hardly worth the trouble of landing it. But by the late 1960s national fishing limits had reached 12 miles from any nation's shore and were on their way to 200 miles. As the Japanese fishermen sailed for home, the Japanese fish merchants caught the first plane to Vancouver. The conversation probably went something like this. "Hi, our boats used to catch the black cod from here." "Yes and you were welcome to it." "So, what happens to it now?" "We don't go looking for it. But if we catch it, we probably land it." "And how much do you land?" "The whole fleet probably lands about 700 tonnes a year." "Well, we'd like to buy all 700 tonnes." "Is that right? And what you thinking of paying for it? "How about twice what you get at the moment?" "Well, how about that? Say, you wouldn't be wanting any more than 700 tonnes would you?" "Well, in fact, we'd like about 10,000 tonnes." "Hmmm. Well we might see what we can do for you." British Columbia's official statistics show that Canada's black cod catch rose from 720 metric tonnes worth 60 cents/kg in 1972 to 4,200 tonnes worth $2.80/kg by 1985. Both figures continued to expand. The same happened in Alaska, on a larger scale. Everyone realised these catches were unsustainable, so in 1981 the Canadian authorities set a quota - just a single figure across the whole fleet, reviewed annually. Licences were handed out to 48 vessels. Each year, black cod fishing ceased (in theory) from the day the quota was reached. This began to protect the stocks, but the resulting fishing practices were a nightmare: every vessel caught fish as fast as possible to ensure it didn't lose out to rivals. In 1981, the quota was caught in 250 days. In 1989 it took 14 days. And that was when a workable system was finally settled upon The maximum catch was divided between the 48 boats. They could catch it when they liked. No stupid rushing; everyone has time to take care of their catch. As the landings are spread over a year not a fortnight, the pricing is firmer. 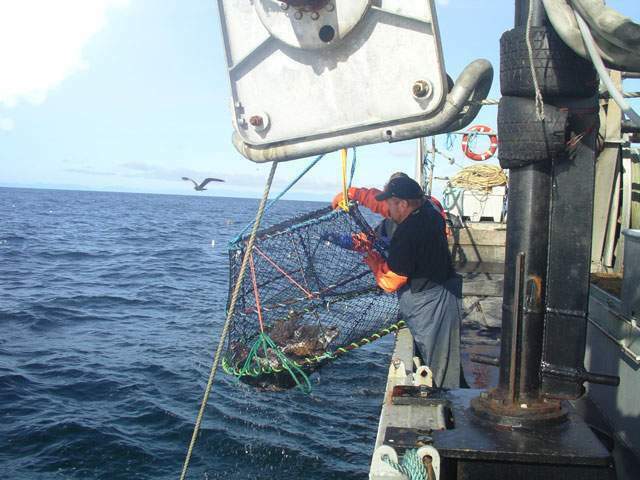 The maximum catch is reviewed annually to maintain stocks. It is lowered as often as it is lifted. In 2016, the 48 Canadian vessels landed 2,700 tonnes worth $11 per kg. Alaska operates a similar regime. Black cod is not yet commercially farmed but they're working on it. The fisheries end of the US Department of Commerce seeded a project in 2012. More recently an ambitious fish farmer, Global Blue, began to try commercialising this work. They released this video in 2017 and updated their black cod blog three times in early 2019. The video is mainly about how their fish farming method is better than traditional methods. Half the black cod catch from Alaska and Canada (about 18,000 tonnes total catch) is exported and Japan has usually taken at least two thirds of that. But the rest of the world is catching up. The secret got out via Noboyuki Matsuhisa, a globetrotting Japanese chef who launched his first restaurant outside Japan in Beverly Hills in 1987. Its signature dish was black cod. Endorsed by keen early customer and now business partner Robert De Niro, the Nobu chain now runs to 24 in all the world's celebrity hotspots. And black cod is still the signature dish. So the rest of the world finally realised what Japan had known forever - this is a very fine fish. A classic Japanese presentation of black cod. The following table, which has been assembled from multiple internet sources, shows the levels of key nutrients in black cod, alongside those for Atlantic cod, enabling you to make a comparison.